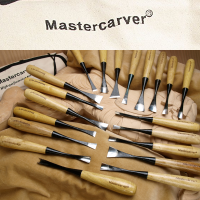 Mastercarver Hand-Forged tools are used and recommended by leading professional wood carvers and teachers. These are fine quality tools at the lowest cost of any major brand. Hand forged from high carbon tool steel, blades are expertly hardened & tempered to Rc 58-62 hardness. Forged “socket” traps wood handle fibers and prevent splitting. 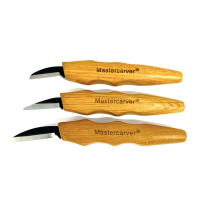 A joy to use, blades are extra thin & sharpened with low angles (22 degrees) to slice wood with minimal effort. 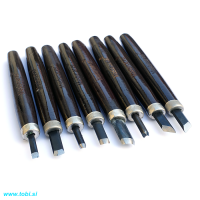 Selections vary slightly but typically contain the following 20-tools: #1-3mm, #1-10mm, #2-6mm, #3-8mm, #4-12mm, #5-3mm, #5-10mm, #6-16mm, #7-10mm, #8-8mm, #8-16mm, #9-6mm, #10-12mm, #11-8mm, #21-6mm, #28-12mm, #32-6mm, #39-10mm, #49-3mm, #49-6mm & heavy duty canvas tool roll. 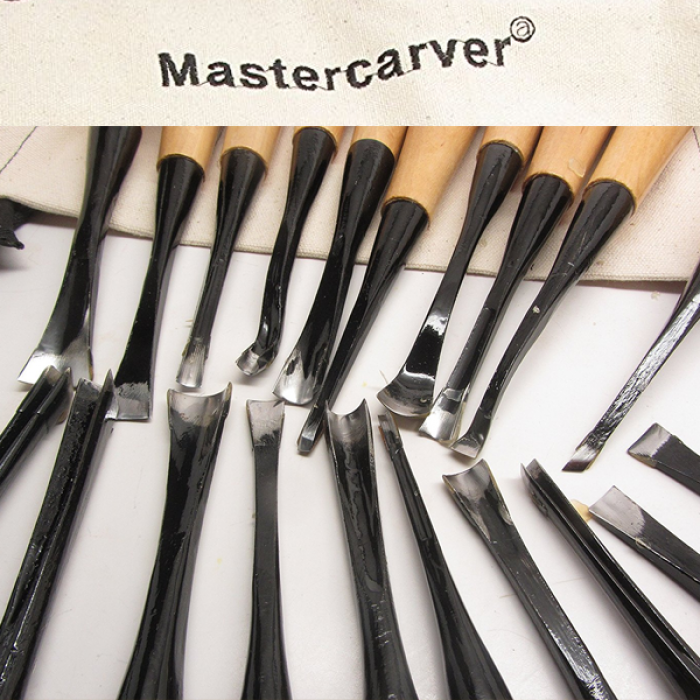 All gouges & chisels are fishtails for better maneuverability, V-tools have negative (reverse) rake for cleaner cuts in cross and end grain. 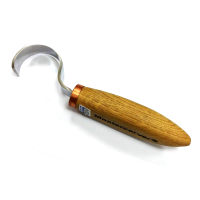 Features durable, socket style birch wood handles. 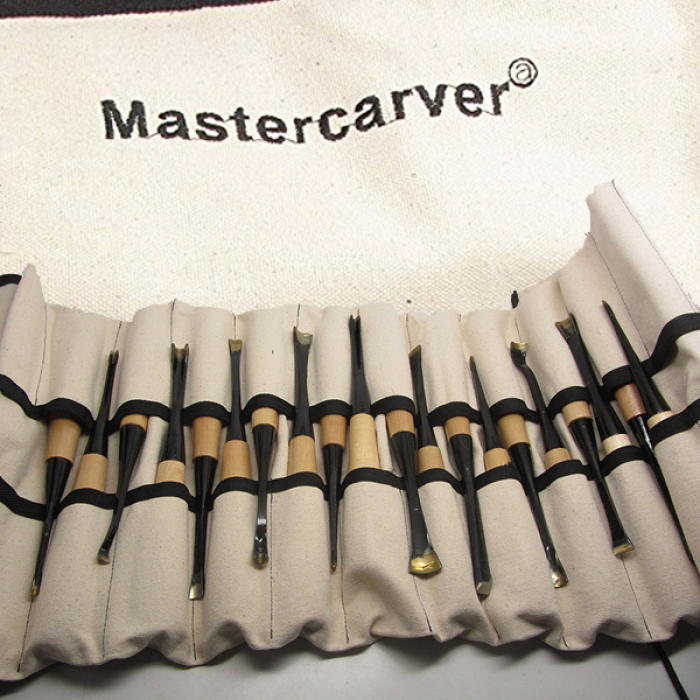 Includes 20 tools & canvas tool roll. Length 9.5″. Pre-sharpened (ready to carve). Great for carousel animal carving and sculpture! 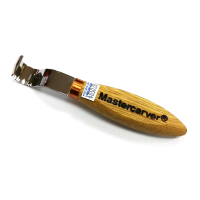 Mastercarver® Hand-Forged tools are used and recomm.. 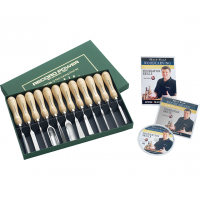 This incredible value package comes with a brand new set of 12 chisel profiles, the RPCV12/A. It als..